Assign all the final positions the value −1,0,1 depending on who wins. where p→p′ denotes all the legal moves from position p. The minus sign is because the players alternate between positions, so if position p is white’s turn, then position p′is black turns (and vice versa). This is the same thing as minimax. There’s approximately 1043positions, so there’s no way we can compute this. We need to resort to approximations to f(p). What machine learning really boils down to is approximating functions given data. So assuming we can get a lot of data to learn this from, we can learn this function f(p). Once we have a model, an objective, and training data, we can go knock ourselves out. Players will choose an optimal or near-optimal move. This means that for two position in succession p→q observed in the game, we will have f(p)=−f(q). For the same reason above, going from p, not to q, but to a random position p→r, we must have f(r) > f(q) because the random position is better for the next player and worse for the player that made the move. We construct f(p) as a 3 layer deep 2048 units wide artificial neural network, with rectified linear units in each layer. The input is a 8 * 8 * 12 = 768 wide layer which indicates whether each piece (there are 12 types) is present in each square (there are 8 * 8 squares). After three matrix multiplications (each followed by a nonlinearity), there’s a final dot product with a 2048-wide vector to condense it down to a single value. This is the log likelihood of the “soft” inequalities f(r)>f(q) , f(p)>−f(q) , and f(p)<−f(q) . The last two are just a way of expressing a “soft” equality f(p)=−f(q). I also use κ to put more emphasis on getting the equality right. I set it to 10.0. I don’t think the solution is super sensitive to the value of κ.
I rented a GPU instance from AWS and trained it on 100M games for about four days using stochastic gradient descent with Nesterov momentum. I put all (p, q, r) triplets into a HDF5 data file. I was messing around with learning rates for a while but after a while I realized I just wanted something that would give me good results in a few days. So I ended using a slightly unorthodox learning rate scheme: 0.03⋅exp⁡(−time in days). Since I had so much training data, regularization wasn’t necessary, so I wasn’t using either dropout or L2 regularization. 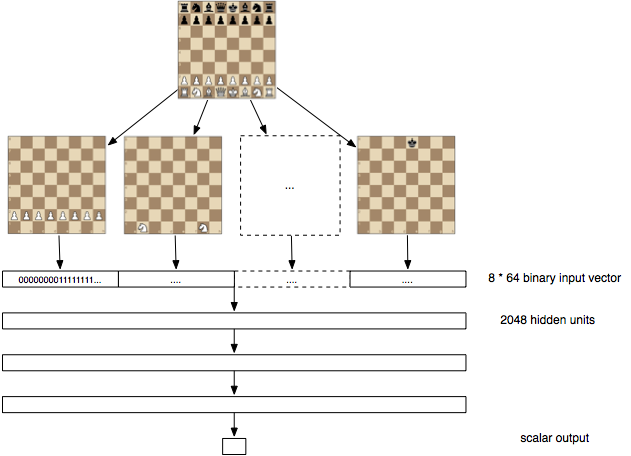 Every chess AI starts with some function f(p) that approximates the value of the position. This is known as evaluation function. This function is also combined with a deep search of many millions of positions down the game tree. It turns out that an approximation of f(p) is just a small part of the playing chess well. 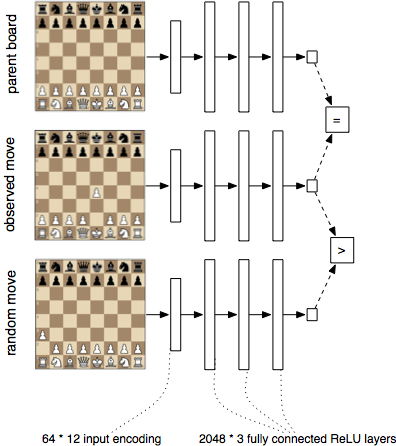 All chess AI’s focus on smart search algorithms, but the number of positions explode exponentially down the search tree, so in practice you can’t go deeper than say 5-10 positions ahead. What you do is you use some approximation to evaluate leaf nodes and then use some variety of negamax to evaluate a game tree of a bunch of possible next moves. We’re going to take the function we learned and use it to evaluate leaves in the game tree. Then try to search deep. So we’re first going to learn the function f(p) from data, then we’re going to plug it into a search algorithm. It’s possible to learn an evaluation function directly from raw data, with no preprocessing. 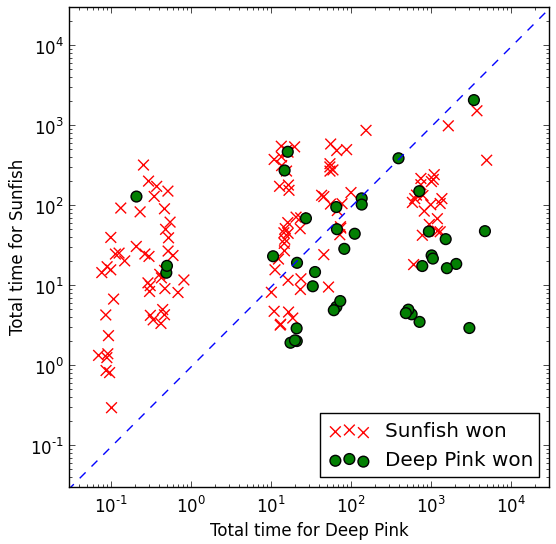 A fairly slow evaluation function (several orders of magnitude slower) can still play well if it’s more accurate. Erik Bernhardsson lives in NYC and since Feb 2015 and he is the Head of Engineering of Better — a company rethinking how mortgages are done. He enjoys giving talks. Previously He’s talked about approximate nearest neighbors, Luigi, and machine learning for music recommendations. He is the co-organizer of the NYC Machine Learning meetup which has talks once a month.